Size: 8 in. to 2 ft. high and wide. Flowers: White, pink, lavender blue, purple flowers on stems 4 to 12 in. above foliage, late spring to summer; fragrant foliage narrow and gray or gray-green. 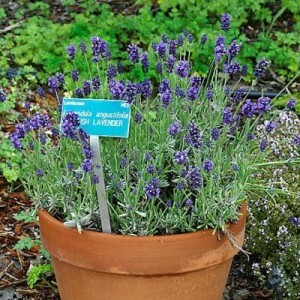 Uses: Small gardens, herb gardens, borders, containers, in heat. Fire resistive. Wildlife: Nectar for bees and butterflies Deer resistant. Rabbit resistant. Soil: Prefers light, well-drained soil, but tolerates a wide variety in its native habitat. Water: Medium; less after established. Pruning: Remove old flower heads; shear back one-half to two-thirds after bloom in fall to keep compact. If plant is woody and open, remove some old growth. Pests & Diseases: Tolerates most. Small caterpillars and similar pests may feed on leaves. Root rot in hot but humid regions. Notes: MANY cultivars with different colors. Some bloom into fall. L. dentata (French lavender) and L. stoechas (Spanish lavender) are also interesting. Hardy to 0° F.